Another idiot without an exit strategy. Exit Strategy! Exit Strategy! Exit Strategy!!!! 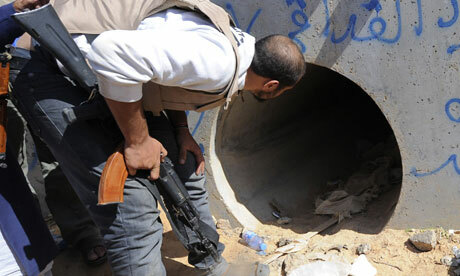 Gaddafi was found in a drainage canal. Oh come on, seriously? Saddam Hussein also had no exit strategy, but at least he was found in a “Spider Hole” hide out on a farm. Colonel G, you in there old boy? Helloooo? A drainage canal is NOT an exit strategy. I suppose Gaddafi was really the dumb boy on the playground then. This entry was posted on Friday, October 21st, 2011 at 05:55 and is filed under Lessons in Dictatorship. You can follow any responses to this entry through the RSS 2.0 feed. You can leave a response, or trackback from your own site.